Since the October 1st, 2017 declaration of independence by Catalonia from Spain, relations between regional and federal governments have remained contentious. In the capital Madrid, a trial has begun that promises to further strain relations between the region and the rest of the country. Having pushed for independence, Catalonia voted for separation from Spain in a referendum that the Spanish government and courts deemed both illegitimate and illegal. In their moment of supposed “glory,” the regional Catalonian government under President Carles Puigdemont celebrated what they thought was a successful secession from the state of Spain. However, as the Confederate states learned in the American Civil War and the British are actively experiencing, withdrawal is much easier said than done. In the aftermath of the referendum, the Spanish government, under then Prime Minister Mariano Rajoy, invoked Article 155 of the Spanish constitution, which allowed the national government to seize control of the local organs of bureaucracy. This led Carles Puigdemont and multiple members of his cabinet to flee to Brussels to avoid trial in the Spanish courts. Yet, despite the rapid turn of events in the region, Catalonia and Spain remain at loggerheads for a plurality of reasons that are derived from the vigorous region’s unique identity and prosperous socio-economic environment. In recent months, political turmoil between Spain at Catalonia has flared up, perhaps to levels even worse than in 2017. 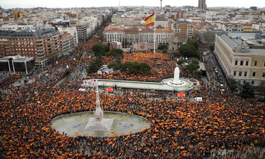 Protests have erupted in many parts of Spain, particularly in Madrid and Barcelona, to protest against the Spanish government’s handling of the independence movement. This comes as the Spanish government charged twelve Catalan independence defendants on charges of: rebellion, misappropriation of public funds, civil disobedience, and sedition. The trial, which started last week, is set to last around three months and has been dubbed the “most important event since Spain’s return to democracy,” the “trial of the century,” and “a stress test for Spanish democracy”. The central government quickly set the tone of the trial with a heavy police and media presence, yet that did not detract protesters from surrounding the Madrid courthouse. The trial will be televised throughout Spain, heightening the implications that will stem from the decision. Catalan secessionist lawyers argue that the trial is a “political exercise” and an attempt to block freedom of expression by the secessionist movement. Furthermore, Andreu Van den Eydne, lawyer for defendant Oriol Junqueras, the former Catalan vice president, argues that: “No international or EU law blocks the secession of a regional entity; self-determination is synonymous with peace and not war.” While, under Spanish law, it is illegal to “revolt violently,” none of the defendants charged engaged in any form of violence during the independence push in September and October 2017. If Spain wishes to send a message to the secessionist movement, they must do so cautiously. However, Spain is plagued by an instability within parliament, where no party has been able to secure a stable majority, as well as growing unrest and mounting pressure from the secessionist movement. Even if the Spanish Supreme Court were to rule against the Catalan defendants, the national scale of the trial will inevitably inflame secessionist feelings. If the defendants win, the secession movement may be mounted again; If they lose, the ruling could be seen as an unjust punishment for what many claim was simply the exercise of the rights of freedom of speech and expression. For Catalonia’s population, the independence issue has split society in two and the consequences of independence for it and the rest of Spain are staggering. Catalonia is the industrial heartland of Spain— known currently for finance, services, and high tech companies. Although the region has only 16.1 percent of Spain’s 46.6 million people, it accounts for 19 percent of Spains GDP. According to the OECD, if Catalonia were a sovereign nation, it would have a a larger economy than Morocco, Portugal, and Greece. Yet, this is largely owed to the opportunities afforded to in a union with Spain and thus the European Union. However, pro-independence Catalan officials have long argued that Catalonia sends too much money to poorer parts of Spain via federal allocations. On the contrary, the central government in Madrid has argued that Catalonia would not be able to survive on their own, as they would have to form its own central bank as well as operate an independent border control, customs, and other necessities, which are currently operated by the central government. Furthermore, many other regions in Spain have pointed to the significant amount of concessions afforded to the semi-autonomous region, which include: their own police force, language, regional government, and president. Since the October 2017 referendum, generations of people have moved to Catalonia for work, although the Catalan economy has suffered since 2017. While the economy hinders in Catalonia, many Europeans are lacking confidence in Spain’s ability to handle conflict, as the Economist Intelligence Unit, a business that compiles an influential annual democracy rating, said Spain risked being downgraded from a “full democracy” to a “flawed” one over its handling of the situation. Any potential resolution to the issue is complicated by the national political situation in Madrid. Pedro Sánchez, the current Spanish prime minister and leader of the Socialist Party, is not expected to last before his current term ends in July 2020. This is due in part to Sánchez’s inability to govern Spain without lack of parliamentary majority as the Socialist Party possesses only 84 of the 350 parliament seats and therefore has to rely on other parties in order to govern, including the People’s Party and the Unidos Podemos Party. Without the majority in Congress of Deputties and despite the fact that Sanchez promised to propose measures that had considerable parliamentary support, Sanchez has not redeemed his goals of increasing unemployment benefits and proposing a law of equal pay for Spanish men and women. The effectiveness of the Congress of Deputies, which hold elections every four years unless a case of a snap election has been questioned for various reasons: one, within the system, the least populating provinces are overrepresented as the population is lower than other provinces which are still awarded one seat, than if the seats would be strictly distributed in proportion to the population of each province. Additionally, the average of seats per constituency is one of the lowest in Europe because of the use of provinces as constituencies. While Sánchez has been open to giving Catalonia greater autonomy, the pressure from the national far-right and right, which includes the center-right People’s Party, led Catalan Vice President Pere Aragones to blame Sánchez’s government for the continued lack of dialogue and therefore imperil any hope of a resolution to the question of Catalonia. With the upcoming 2019 budget vote, Spanish officials fear a protracted fight that will transcend financial problems as the Catalan and conservative parties use the situation as a means to fight over Catalonia. Only time will tell if the result of this will be further turmoil for Catalonia, Spain, and, unfortunately, the European Union, which cannot afford any further weaknesses with slowing economic growth and Brexit on the horizon.